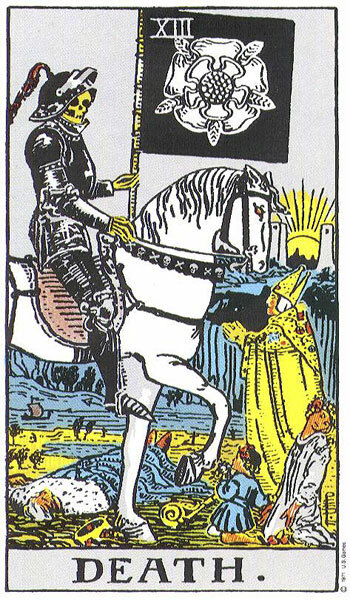 This is the fourteenth in a series of blog posts discussing major figures in film and literature, based on the Major Arcana of the Tarot. I'll be using the 21 Major Arcana of the standard Rider-Waite-Smith Tarot deck. For some more background on the deck's history and its elusive role in popular culture, see this post from HiLowBrow, which is a good primer on the Tarot, and pretty fascinating in its own right. In both the movies I've seen and in the occasional real-life readings I've gotten, the Death card is always handled gingerly. Card Readers tend to equivocate around it a bit... "Oh, Death doesn't just mean someone is dying, or something terrible is happening. It just means one phase is ending, and something new can begin!" Yes, Fortune Teller, we understand. You don't want us to think we have cancer or anything. So we could equivocate in choosing a representative from pop culture to correspond to the Death card, with its mounted skeleton like something from The Elder Scrolls, and its kings and beggars alike being trampled by that harbinger's deadly hooves. We could choose someone totally unexpected, like Walt Disney, or someone fun and trivial, like M. Night Shyamalan. Luckily, we don't have to equivocate. We can look Death straight in the face, because as art-house cinema nerds, we know exactly who it is. It's Darren Aronofsky. You may object! "But Aronofsky makes lots of different types of films! They go from gritty and realistic, like The Wrestler, to The Fountain, which is so soaringly New Agey that our Wiccan grandmother liked it!" Well, yes, the guy has crafted lots of different films, and he's explored lots of different styles. But come on. Look at every one of his films and consider how it ends. The Fountain may be a little more obscure, but it definitely shares the basic thematic preoccupation... and Requiem for a Dream, his only film that doesn't end with a single, literal, plot-sealing death, is so filled with misery that the whole thing could be read as an extended, fatal seizure of dissolution. There's a deeper truth, though, something necessary and compelling about this unbreakable habit that Mr. Aronofsky has exhibited. He doesn't make films about fleeting dramas or poignant moments in his characters' lives... he doesn't make films about a hero winning a decisive victory over a scenery-chewing villain. Even the best of his contemporaries are still making that type of film, but all of Aronofsky's films point in a different direction: his films point to an absolute ending. The way he makes this beautiful is that he dramatizes the throes of self-discovery and redemption and closure that lead to that final resolution. In a sense, each of these characters -- Max from pi, Randy the Ram, Nina from Black Swan -- discovers him/herself in the final, strained, often crushing revelations that lead them to their fates. Death is not interesting because "Oh, it's not really death"... it's interesting because of what you discover as you approach the precipice. And yes, it IS death. 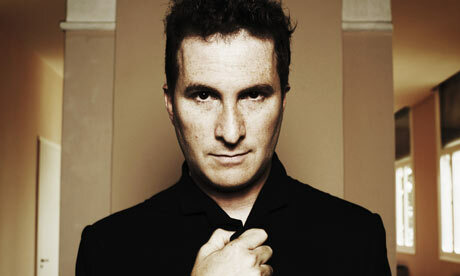 Darren Aronofsky draws the card for each of his protagonists, and when they look at him with sad eyes, he says, "Sorry. That's just how it is."